What's this? 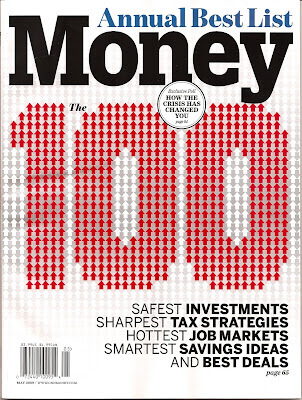 Oh, it's just Money magazine's annual list of the 100 "best investments, strategies, products, and people in the world of money," that's all. Tum-te-tum. And leafing through, what do we find? HOLY CRAP. This blog is the world of money's second best investment, strategy, product, and person! Lil' old It's Lovely! I'll Take It! We're number two! We're number two! We're number two! To which I have to say: watch your back, FNBO Direct Online Savings Account. Watch your back. You go, girl! You absolutely deserve the recognition ... your blog is wonderful! Congrats! Just had to say that I literally LOL'ed at the "attack" on #1. You are too funny!! That's the coolest thing ever! I'm glad your hilarious awesomeness is being recognized! Although "highly amusing commentary" is an understatement. Holy Crap that's fantastic! Your blog definitely does deserve recognition for all of the laughs it delivers! *Applause, applause! * When I first found your blog, I spent nearly two weeks reading back through it, and now I anticipate every new posting. I've never done that before, but really, your blog appeals to everyone. Go you! I really did laugh out loud at your attack on #1. Way to go, Sara! Wow! Congratulations, that's so cool :o!! Awesome! Now the money's gonna come piling in, right? Exactly, Karasu. I do this for the great big piles of money that are delivered to my Swiss bank account every week. Did they mention any of the really great commentors? You guys are #3 through #100, Gamzulatov. You had a great idea -- congrats!!!!!!!!! Woohoo!! About time someone noticed!! That's pretty cool. It's always nice to see someone get recognized unexpectedly when they were just plugging away at that thing they were doing mainly just to make the world a bit more amusing. In celebration, I'm going to go comically vandalize as many homes for sale for fodder for future posts as I can before I get arrested! Next up, Psychology Today. Your wit should be available on prescription. Very cool, Sara, kudos; lovely blog indeed. Third the one with the hairy chest. Did I say it, or did I say it? "The next big thing." Congrats! That is awesome, good for you! I agree with your own tag - blogtastic! Woo hoo for you! Congrats, Sara!! You deserve the props, fo sho!! Incidentally, we must be selling our home the right way, since we haven't shown up on your blog yet. That is AMAZING!!! Good for you. This site cracks me up every day! Outstanding! So well and richly deserved. We are so happy for you. Suh-weet! Congrats on the mention! Oh my goodness. Congrats and keep up the exceptional work. Congratulations!! I love your blog! And I am now petrified of buying a house! Yay exclamation points! We have been on this site since sunday when we found you in Money mag. Maybe we should have clued you in, but we thought you knew! Love the site! Way to go! I love your work and totally saw the popcorn popper as well. Should I be worried for us both? Congratulations! You definitely deserve it! I'm not even sure how I found you site! I was enjoying my cup of coffee checking my Reader and someone had linked to you.....and I proceeded to shoot my coffee all over my computer while shrieking with laughter. Sometimes the listings are funny as is.... but really it's your spin and flair that has me literally, crying with laughter! That is so awesome! Doo de doo, reading along through my BlogHer updates-- yowza! You rock, Sara! "San Diego Home with Charm"
Does not meet ADA standards.